I decided to share my newest technique experiment with pouring watercolor backgrounds with spattering and negative painting thrown in. I was inspired by a new book I bought, by Roland Roycraft, in which he demonstrates these techniques. An image I had taken 30-odd years ago popped up in my mind, and I thought it would make a good subject for this exercise. 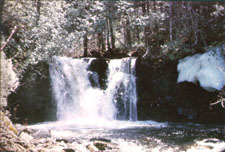 The photo was taken while on a canoe trip in the northern Minnesota wilderness lakes area. I was portaging between lakes when I came upon this waterfall with huge pieces of ice still clinging to the rocks in the protected shadow areas. It was early June and there were still remnants of the winters snow here and there. Yes, the water was very cold!! I sketched the scene onto a piece of half-sheet 140lb Arches cold-press paper and taped it to a piece of foam-core board. I knew I would be slopping a lot of paint around, so the light-weight foam board was chosen. I simply used masking tape to attach the paper to the foam board, all the way around. I have clear packaging tape applied to the foam board first so the masking tape will come off easy later. I also used masking tape to cover the large areas I wanted to preserve as white and used masking fluid for the edges and details. I covered the water, ice and foliage highlights I wanted to preserve with the masking. Pour it on! Now comes the fun/scary part. I poured 3 primary colors onto the paper, using my imagination as to where I wanted the warm and cool areas to be located. I pushed some of the color around with a 1 inch flat to help steer the paint, and then just let it mix. When I was satisfied with the coverage, I wiped the excess off at the edges and let it dry. I used Aureolin, Permanent Rose and Cobalt Blue. After the initial washes were dry, I added another layer of washes strengthening the shadow areas and adding form to th foliage. 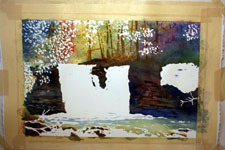 On top of these washes I splattered darker mixes of color to add texture to the foliage. Some of this splattering blended in and some did not, depending on the moisture in the paper. 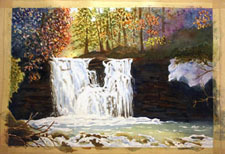 I darkened the foreground rocks and scraped some rock texture into the background on either side of the waterfall. Colors used for this step were; winsor blue, permanent rose, permanent mauve, quinacridone gold and cadmiun red light. 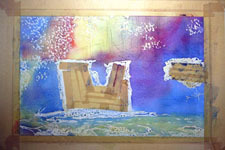 With the previous washes dried, I added additional color to the rock formations to build shape and depth. I also added some tree shapes at the top to help define the woodsy feel. 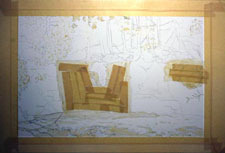 Colors used are ultramarine blue, winsor blue and burnt sienna. 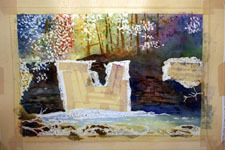 In step 5, I added another layer of washes to the rocks in the foreground and also the area above the ice formation at the upper right. I added a little sap green and burnt sienna to suggest green foliage here. I also started painting darker negative shapes in the foliage at the top, to help give an illusion of depth looking through many leaves and limbs. Here I removed the masking material so I could get a better idea of how the negative painting values compared to the overall look. I added a little more negative painting darks here and there to suggest more depth. 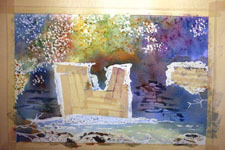 Now I began to add color and detail to the water and ice formation. I used cobalt blue, winsor blue and burnt sienna and a touch of permanent rose. I continued to develope the rest of the foliage to add depth and mass. I colored some of the masked out areas as well as negative painted around them to add mass. At this point, the painting looked finished, but there was something about it that didn't grab my eye like I thought it would. After letting it set overnight, I decided that the isolated light areas in the foliage looked like they were floating in space, and I needed to change that. I decided to go for a dramatic lighting effect and lifted out alot of the paint that I just finished putting down! 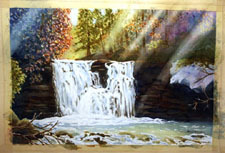 I brushed clean water onto the areas I wanted to lift and gently scrubbed at them with the brush until I lifted enough paint to suggest strong rays of light filtering through the trees. I scrubbed and blotted the loose pigment with tissues, until I was satisied with the look. Then I was satisfied with the result.